Texas man gets first full face transplant in U.S.
Dallas Wiens may soon be able to kiss his daughter, Scarlette, again, now that he has become only the second person in the world to receive a full face transplant. The 25-year-old Wiens, who lives in the Dallas-Fort Worth area, received the new face at Boston's Brigham and Women's Hospital last week, when a family donated a loved one's tissue for the transplant surgery. The forehead, nasal structure, nose, lips, facial skin and underlying muscles and nerves that allow Wiens to move his face and have sensations were transplanted. The hospital would not reveal the actual surgery date to protect the privacy of the donor family. "Dallas was injured in November 2008 when his face got too close to high-voltage line while on the job," Dr. Bohdan Pomahac, Brigham and Women's Burn Unit director, told reporters Monday. "He sustained devastating injury leaving him with bare bones instead of face." Pomahac said the purpose of the full face transplant is to restore "human appearance and function." After his face healed from the accident, Wiens' only facial trait was his mouth. Once his new face heals, he will not look like himself, nor will he look like the donor because the new tissue will mold to the young man's remaining tissue and bones. Wiens' grandfather, who is with his grandson in Boston right now, calls the surgery a miracle. He says after his grandson was so seriously injured, he did not know what would happen. His grandson, he says, is determined to "get well and move on with his life and make something of his life." Wiens has been walking and talking to his family in Texas by phone. Doctors expect he will be eating on his own soon. His doctors expect Wiens will eventually regain sensation on his forehead and right side of the face and most of the upper and entire lower lip. Damage to a few nerves on his left side were too severe, so doctors do not expect very much sensation to be restored to his left cheek and left forehead. One thing surgeons couldn't restore was his eyesight. "Unfortunately we do not know how to transplant, at the current age, eyes, so we were not able to restore his vision," said Pomahac. Pomahac said when he first saw Wiens' injuries he feared they were too extensive to allow for a new face to grafted on. The blindness was also a consideration. But, Pomahac says, "We have the obligation to help if we can." Last April, surgeons in Spain successfully completed the first ever full-face transplant. Three months later, the patient, only identified as "Oscar" stepped before the cameras of the world. In December 2008, Connie Culp became the first American to receive a "near" full-face transplant after surgeons at the Cleveland Clinic replaced more than 80% of her face in a 22-hour operation. Culp had survived being shot in the face by her husband. France's Isabelle Dinoire, who was mauled by a dog, was the first person ever to receive a face transplant back in November 2005. French surgeons replaced part of her face, including her chin, lips and nose, with those from an organ donor. 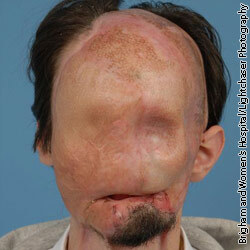 Brigham and Women performed its first partial face transplant in 2009. According to Pomahac, that patient is now on the lowest dose of anti-rejection drugs compared with the other face transplant recipients in the world. Wiens' doctors say he is doing great and meeting all his milestones. They say he will stay in the hospital for the near future and eventually return to Texas. But recovery of the nerves will take months. 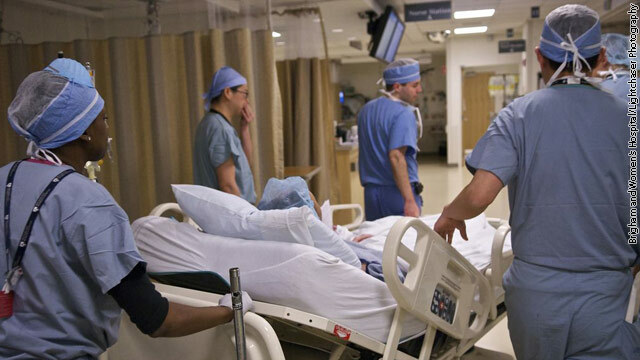 Pomahac says two other patients are waiting for face transplants at Brigham and Women's. He believes face transplants will continue to be rare unless the qualifications for the surgery change or more qualified patients are found. Before a patient can receive a face transplant, a blood and tissue match has to be found, plus a patient has to be able to comply with taking the necessary drugs to prevent the rejection of the new face. Also, patients need to be mentally capable of handling having a face that is different from their own. « Previous entryDo dentists still give antibiotics before cleaning teeth? There's no after pic because he just had the surgery guys.. it takes a few weeks for the tissue and muscular swelling to go down. His face right now looks nothing like it will look like in a few weeks. Usually facial transplants require follow-up surgeries to tighten the skin and adjust the muscles so that their movement is natural and not impeded. If they were to show an after pic when he got out of surgery, it wouldn't look too promising. But given a few weeks, I'm sure he will look great. He has a young daughter, who probably misses her dad's face. Don't really understand why people feel it necessary to make cruel remarks toward him. He was injured in an accident.. it could happen to anyone of us. Thankfully, he is in the hands of some of the best surgeons in the world, in the ones at Boston Brigham and Women's hospital. oh i guess cnn doesnt believe in freedom of speech. they erased my comment. sorry i offended u highness of the editing room. The future holds only good, greatfull things for people like this. May only love and compassion follow you with age, and future. Life is a gift as we all should know and see. Although things like this present hints to what we have and what we all shall take for granted. My love truly to you and your entire family. to CNN,since some insensitive bloggers feel their comments fall under the heading"freedom of speech"maybe you should take a stand, your "Terms of Service"says no obscene(disgusting to the senses) comments.if they feel they can skirt the Amendment then you need review your Rules of Conduct. will they be able to put in glass eyes for appearance sake after this surgery? It appears that he still has eye sockets that could accomodate them. It's not mentioned specifically in the article, but it would do wonders for his overall appearance afterward. Poor young man. That was a totally devastating accident. 😦 he looks kind of scary but I'm glad this guy is getting a new face god bless him. and what happend to his eyes? Medical science has come a long way. My prayers were with Mr. Wiens. Maybe someday in the future they will be able to restore his eyesight as well. God Bless. This young man is very courageos and I wish him the best. But I know if it were me I would much rather be dead. He is amazing. He is doing all this for his young daughter. He is courageous beyond words. This young man is very admirable indeed. What compassion and love. I sincerely hope Mr. Wiens will have a successful recovery and a happy life. What a brave soul he is to undergo such a surgery and also to allow his damaged face to be exposed to the world so that we can learn from his experience what a miracle surgery can be done to restore some semblance of normalcy. I feel more sorry for the people who heartlessly laugh at him for his pre-face look than I do feel sorry for Mr. Wiens. At least Mr. Wiens has a loving family around him. God is with you, Mr. Wiens. May He give you strength, patience, grace and especially faith to believe that good will come of this – not just for medical science but for YOU. You will be in MY thoughts and prayers. I would feel honored to see your restored face and to hear a follow-up on how you get along in life after your full recovery. I am certain you will be surrounded by angels and other helpful people. God bless you. I truly think I may may have killed myself if this happened to me. I pray for him to recover and have a normal new face. Maybe someday doctors can give him eyes that work. Who knows, maybe a computerized eye? God bless him. I hope the person to have full recovery and should have a happy life. But I also salute the doctors who did this miracle. Those doctors gave the person a second life to live in this beatiful world. The government should have a special mechanism to appreciate the contribution of those doctors and their family; safety of them from all negative aspects of life. What an amazing and brave man and family. I pray for his quick healing after the surgery, and commend his determination to get on with his life. That's so much more than I think I could do in his shoes, and so admirable. God bless you! IN RESPONSE TO T-PARTIER4EVER: I really think that social Darwinism has no place in these comments. This unfortunate situation only serves to highlight the incredible need in this country for a medical safety net be it affordable insurance, an employer mandate or a direct government plan. It is bad enough that we have to play economic roulette with our employment, our retirement and our personal finances but to have to face the prospect of a catastrophic illness or injury without protection is the truly unconscionable part of the equation. Mr Wiens is so very fortunate that dedicated medical professionals were willing to step up and contribute their skills and talents, but it shouldn't have to be that way. After all, only by the grace of God any one of us could find ourselves in similar dire straights. Good luck and good life Mr. Wiens. May nothing but good things come your way. Good luck and GOD bless you. Your daughter has a wonderful father and you are her hero. Blakes! Got a new face! God I hope he can live a normal life. So much he's lost. I want to cry. That's a very good article. I'm sick of all the Wars, death & hate so a good story is a great change. I have never been so moved by any story. So many times in life, we are ungrateful about things and yes, I am including myself in that camp. The higher power works in mysterious ways, and I have just been reminded that I should be thankful for everything that I have. I really hope to God that this gentleman lives to see happiness in his life. My prayers and thoughts are with him and with his courage he will back in no time. I admire this mans will its incredibly strong. The comments on here are so generic though "god bless" "pray this pray that" really? If a miracle had anything to do with it it wouldn't have happened in the first place. Wheres the praise for the surgeons that will put their knowledge and skill to the test for over 20+ hours with a persons life on the line. Technology and doctors skill will be challenged no doubt, it took many decades to perfect advanced transplant techniques so one out of hundreds succeed its not a miracle its called trial and error till the error is no longer valid. Quit dumbing forums down with supernatural meanderings. it was electrical so signs mustve been all over the place. nothing brave or inspiring about this guy, he was just dumb to do this and lucky enough to find a donor. Grow up – Accidents happen, if it were you You'd change your tune! Hope the future improves this persons quality of life. I have no feeling of horror looking at the person's face. But I fully understand a desire to regain a face. I wish this man the very, very best. I think it is amazing we have come so far with our medical science. Please ignore the trolls here. I don't wish an accident to happen to them, even. But I hope something helps them to understand that accidents happen and it is terrible and the victims should be helped. Grow up! Very well said! I cannot stand unsympathetic morons. I say the Brian guy who enjoys hatred and cruel remarks is "dumb" id on't even like that word!!! I pray for the young man who had the face transplant...he and his beautiful little daughter will enjoy life even more every step of their journey! People don't think about the family when people do "dumb" things..he does need to grow up!!! May God help that poor man to be,completely, healed. I feel very sorry about his disfigured face after the terrible high-voltage electric shock. How, truly, very sad. A person essentially help to make severely posts I might state. That is the first time I frequented your website page and to this point? I amazed with the research you made to make this actual post amazing. Fantastic process!